The fact that these skills were once explicit is what differentiates them from implicit learning, where a skill is acquired without ever going through a stage where the knowledge involved is explicit. The presence of an explicit stage has various advantages from an educational viewpoint. For instance, a driving instructor can explain the rationale behind a particular sequence of actions to the learner driver. This is particularly useful when giving instruction about rare and/or dangerous situations. A simple way of checking whether or not an activity involves compiled skills is to try having a conversation with the person carrying out that activity. If they are able to have an intelligent conversation during the activity without noticeable problems, then compiled skills are probably involved. For example, a skilled driver or cyclist will be able to conduct a perfectly normal conversation while changing gear or riding a bike. The situation is slightly more complicated when the skill involves a verbal component, as with touch typing (i.e. typing without needing to look at the keyboard) and writing with a pen. In these cases, the activity itself will interfere with having a conversation, so the “intelligent conversation” test can’t be applied. The give-away in such cases involves a key feature of compiled skills, namely speed. Touch typists are a good example of this feature. A skilled touch typist can type significantly faster than would be possible if they consciously checked the position of each finger and each key for each keystroke. That’s why I learnt how to touch type; I’d hit the ceiling for speed with “hunt and peck” two fingered typing, and to go any faster, I had to compile the skill. The name compiled skills comes from cognitive psychology and Artificial Intelligence. It’s explicitly based on the concept of compiling software, thereby transforming it from a slow format that humans can easily understand into a much faster format that humans can’t easily understand. This appears to be a similar process to the one involved in human compiled skills. Compiled skills are typically fast and fluent, with few errors. Those are big advantages. There’s also another big advantage that comes with compiled skills. The fact that they don’t require conscious thought means that they leave more cognitive capacity available for other activities to go on at the same time. A classic example is a skilled driver, who can use compiled skills to handle the physical activities of driving, while concentrating mentally on assessing what’s happening on the road ahead – for instance, deciding whether there’s enough space to overtake a cyclist safely. There are also disadvantages that come with compiled skills. One disadvantage is that they are prone to strong but wrong errors. These occur when a person does something familiar as a result of over-strong habit, rather than doing the right thing. A classic example is trying to unlock a door with the wrong key; the usual pattern is to choose a frequently-used key, rather than the correct one. This has been well recognised in some fields for centuries. The French phrase for an unexpected deadly blow, a coup de Jarnac, dates from a duel in 1547 where Guy Chabot de Jarnac lured his opponent into a strong but wrong error, and then attacked with a devastating blow that he had practised until it was a compiled skill. In some safety-critical systems, designers deliberately introduce blocking functions to prevent users from committing strong but wrong errors. Another disadvantage of compiled skills is that they can be severely or completely disrupted by any attempt to think about them while using them. Again, this is well known in competitive sports, and is part of the reason for the cliché in martial arts movies about the student needing to focus on doing, not thinking. 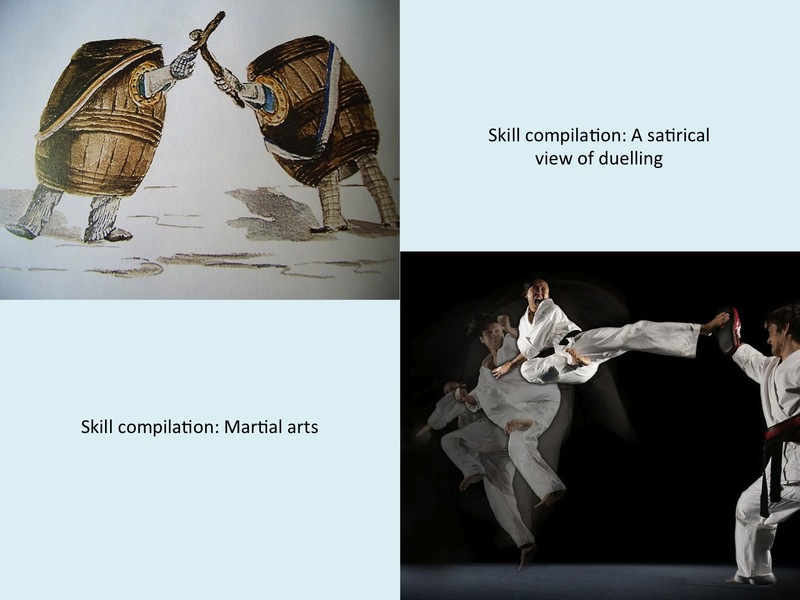 Compiled skills are ubiquitous and invaluable. They are usually faster and more accurate than the corresponding uncompiled version of the same skill. They also free up the user’s conscious cognition for other activities such as higher-level monitoring and planning. A key feature of compiled skills that has significant practical implications for education is the time that they require to develop. Skill compilation requires a lot of practice over a significant amount of time – typically weeks, rather than days or hours. This can be a real problem in cases such as children learning to write, where the child cannot reasonably be expected to move on to activities such as creative writing if they have not yet managed to compile their handwriting skills. Another key feature of compiled skills with significant implications for education is that attempting to introspect into a compiled skill will make the student’s performance worse, not better. Although there are situations where student reflection is a commendable activity, those situations do not include compiled skills. A third feature of compiled skills with implications for education is assessment. Compiled skills by definition cannot be validly assessed using verbal introspective methods such as examinations or multiple-choice tests; they can only be validly assessed via methods that are based on physical performance. This article does not aim to give an exhaustive description of compiled skills and their educational implications. However, it does give an example of how the framework above can give specific practical and theoretical insights into a particular knowledge type and its implications for education, based on empirical evidence from the literature. We will examine other cases in later articles. This entry was posted in education theory, error, expertise, our research, useful concepts, verifier and tagged muscle memory, skill rehearsal, sports pyschology, strong but wrong, the flow by hydeandrugg. Bookmark the permalink.